Over the last 25 years the DJ CD Player has evolved from its simple rack mount roots into a tabletop digital deck. Pioneer's CDJ range was instrumental in changing the face of the DJ booth the World over - eventually toppling the Technics SL1210/1200 from it's position as the industry standard audio source. 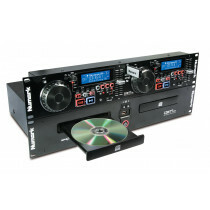 A DJ CD player is a specialized digital music player for DJing which often features large jog wheels to provide tactile control over the playback of audio. While most manufacturers originally designed their kit to play music from compact discs, many of today's DJ CD players play digital music files stored on USB flash drives or SD cards. 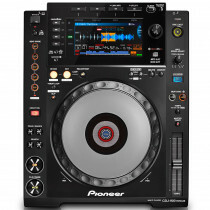 There are a wide range of manufacturers supplying CD players in addition to Pioneer DJ with Numark, Denon, Gemini and others creating innovative products to feed the hunger of DJs looking for the next killer feature that can take them from the bedroom to the booth. While the CDJ range from Pioneer is the inductry standard there are models available to fulfil the needs of those who have a more modest budget such as the Numark NDX range. 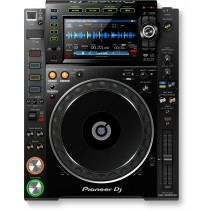 A typical set up will see at least two DJ CD players connected to a DJ Mixer. Common features in addition to CDJs jog wheels include pitch faders that allow manipulation of tempo, in addition to this expect to find play and cue functionality and loop functionality. Many have additional features such as beat analysis and waveform displays and the current trend of touchscreen navigation allows you to browse media with simple gestures. Another common feature is the ability to function as a DJ controllers using MIDI over USB to control the playback of digital files in DJ software running on a laptop instead of playing the files on the CD Deck itself. DJ CD players are often referred to as CD Decks and CDJs - even though the latter is a range it has become synonomous with digital djing and as such is often how DJs refer to tabletop cd players. We should also mention that 19 inch rack mount DJ CD players are still available - these are a great back up for mobile DJs who need an inexpensive system to provide them with piece of mind when they're gigging.